Skye Bork, the first D.C. resident to win the Distinguished Young Women of America national competition, won more than $30,000 in scholarship money. 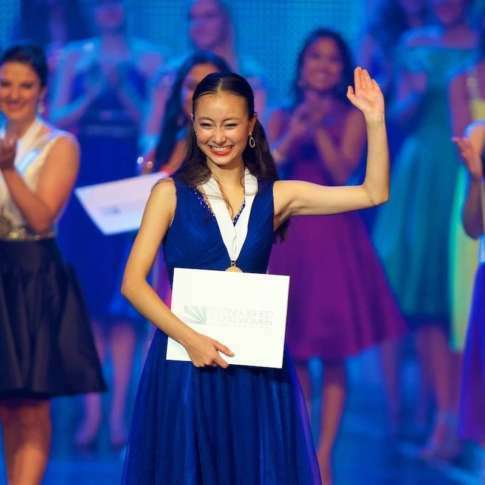 WASHINGTON — Distinguished Young Women of America has provided an opportunity for young ladies in their final years of high school to win merit-based college scholarship money, and for the first time in its nearly 60-year history, the national winner is a D.C. resident. “I saw this really awesome organization committed to the empowerment of young women. And having gone to an all-girls school my entire life, I thought that it would be such a neat way to get involved,” 18-year-old Skye Bork tells WTOP. She decided to look into the program after learning about it from a friend and role model who participated in Georgia. Bork competed in the three-day Distinguished Young Women national contest in Mobile, Alabama. On July 1, she won a $30,000 scholarship as part of the national title as well as an additional $5,000 for placing in the top four of each of the competition’s five categories: scholastics, interview, fitness, talent and self-expression. She also earned $1,500 for being named the Washington, D.C. representative. A local chapter of Distinguished Young Women had been operating in D.C. but was discontinued during the 1980s. It started up again two years ago. Mohra Gavankar, Distinguished Young Women D.C. Program Chair, said DYW scholarships go directly to the winner’s college of choice. If winners happen to earn a full ride to college, the funds remain in the bank to help pay for graduate school. Gavankar says this program places strong emphasis on academic achievement. Her passion was fueled even more this summer as she worked to create a ballet curriculum for 7 and 8-year-olds that enabled her to combine math and performing arts. She worked in collaboration with faculty at the Washington Ballet at THEARC. It was her way to help introduce youngsters to a STEM subject in a fun way. But the task didn’t stop with curriculum creation. Bork said she’s also been receiving requests to introduce the program at other schools. She plans to attend Columbia University in the fall.